Humayun's son, Akbar the Great, is conventionally described as the glory of the empire. Akbar reigned from 1556 to 1605, and extended his empire as far to the west as Afghanistan, and as far south as the Godavari river. Under the guidance of Bairam Khan, who had been instrumental in Humayun's reconquests of Panipat, Dehli, and Agra, Akbar instantly began seizing more territory throughout Hindustan. The reign of Akbar was a period of renaissance of Persian literature. The Ain-i-Akbari gives the names of 59 great Persian poets of Akbar's court. Abul Fazl's Akbarnama and Ain-i-Akbari were complementary works. Akbar and his successors, Jehangir and Shah Jehan greatly contributed to the development of Indian music. The Mughal architectural style began as a definite movement under his rule. Akbar's most ambitious and magnificent architectural undertaking was the new capital city that he built on the ridge at Sikri near Agra. The city was named as Fatehpur to commemorate Akbar's conquest of Gujrat in 1572. The most impressive creation of this new capital is the grand Jamia Masjid. The tomb of Akbar the Great is the mausoleum of Mughal Emperor Akbar, in Sikandra. The construction of this Mughal architectural masterpiece was started in 1600 by Emperor Akbar himself. Jalaluddin Muhammad Akbar is regarded as the greatest Muslim ruler of Indian history. As the grandson of Babar and the son of Humayun, he was the third Mughal Emperor in India. After his defeat in the hands of Sher Shah, Humayun fled from place to place to save his life. Suffering great hardship, he travelled through the deserts of Sindhu and at last reached as place named Amarkot. The Hindu King of that small kingdom gave him shelter out of kindness. It was at that place that Humayun’s wife Hamida Banu Begum gave birth to a son on 23 November 1542. That child was Akbar. Though Humayun was unfortunate as a king, he was indeed fortunate as the father of as son who was destined to been as great. After the birth of Akbar, Humayun fled from Amarkot. Only his way towards Kandahar, he even abounded his newborn babe in order to escape capture by the enemies. The child Akbar thereafter fell to the hands of his uncle Kamran who was and enemy of Humayun. Humayun finally reached Persia. The king of Persia gave him shelter in his capital. With his help, Humayun conquered Kandahar from Kamran in 1545. Next, he conquered Kabul, and got back at the place of his little son, Akbar, from the hands of Kamran. In Kabul, Humayun waited for years before coming back to India to regain his lost throne. The opportunity came at last when Islam Shah, the Son of Sher Shah, died in 1544. Taking advantage of the internal struggle in the Sur dynasty for throne, Humayun conquered Delhi and established there the Mughal rule once again. But he was not destined to rule. In 1556, he fell down from the stairs of his library and died of the fatal wounds. Himself as learned man, Humayun had tried to make his son educated. 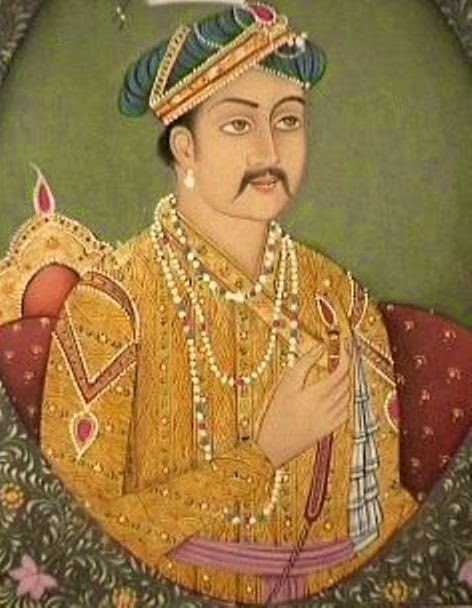 From his age of five, Akbar was placed in charge of tutor after tutor. But no teacher could teach him to write or to read. His memory was sharp, but he showed no interest in studies. Instead, young Akbar spent most of his time in games, sports, riding horse and playing sword. Yet, this young prince of no education came to been regarded as one of the most learned men of Asia when emporer. Akbar was one of the illiterate great men of History. He spent his youth learning to hunt, run, and fight and never found time to read or write. He was the only great Mughal ruler who was illiterate. Despite this, he had a great desire for knowledge. This led him not only to maintain an extensive library but also to learn. Akbar had his books read out to him by his courtiers. Therefore, even though unable to read, Akbar was as knowledgeable as the most learned of scholars. Akbar came to throne in 1556, after the death of his father, Humayun. At that time, Akbar was only 13 years old. Akbar was the only Mughal king to ascend to the throne without the customary war of succession; as his brother Muhammad Hakim was too feeble to offer any resistance. During the first five years of his rule, Akbar was assisted and advised by Bahram Khan in running the affairs of the country. Bahram Khan was, however, removed and for a few years Akbar ruled under the influence of his nurse Maham Anga. After 1562, Akbar freed himself from external influences and ruled supreme. During his reign, Akbar managed to subdue almost all of India, with the remaining areas becoming tributary states. Along with his military conquests, he introduced a series of reforms to consolidate his power. Akbar practiced tolerance aimed at Hindu-Muslim unification through the introduction of a new religion known as Din-i-Ilahi. He appointed nobles and mansabdars without any religious prejudice. Akbar's religious innovations and policies, and deviation from Islamic dogma, have been a source of debate. Akbar was as boy of 14 when Humayun died in Delhi in January 1556. He was at that time in the Punjab. The news of the emperor’s death came as a shock to the Mughals. But, fortunately for young Akbar, he had as powerful guardian named Bairam Khan to help him. At a place named Kalanaur in the Punjab, Bairam Khan placed Akbar on throne and declared him as the new Badshah. The death of Humayun made the Afghans bold enough to reconquer Delhi. Sultan Adil Shah of the Sur Dynasty was the strongest of the Afghan Princes at that time. His Hindu minister, Himu was the real source of his strength. Himu was ambitious statesman as well as an able general. He defeated the Mughal forces and reconquered Agra and Delhi. With that victory, Himu styled himself as Raja Vikramjit or Vikramditya. The Mughal Empire came very near to and ends only the soil of India. In as situation like that, a battle between Akbar and Himu became imminent.